Except for earning the Cartel Coins by subscribing the game, now you have another more convenient and simpler choice. 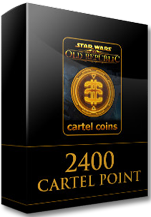 Directly buy a card of 2400 SWTOR Cartel Coins! Now on Mmosale, we have cheap and reliable, 100% legal and brand new. Buy with the cheapest price. You can use the coins to buy unique items which can improve your character’s power greatly. The Star Wars The Old Republic CD Key will be delivered by email within 20 Minutes as soon as we confirmed your order. Moreover, our customer service is 24/7 online to offer professional support.